Soder-Wick® Lead-Free is the state of the art in desoldering technology. 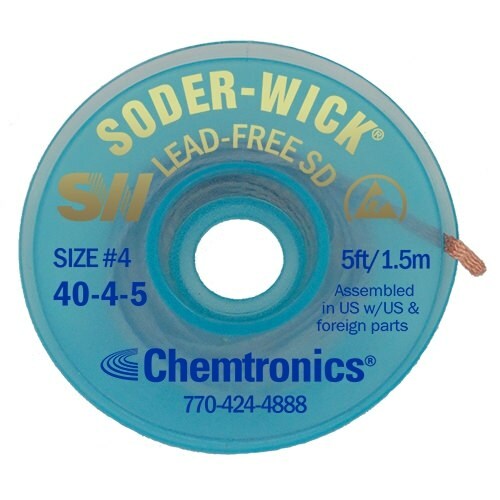 It is specially designed for removal of today’s high-temperature lead-free solders. The single layer weave used for Soder-Wick® Lead-Free braid is lighter in mass than any other desoldering braid available and allows for lead-free solder removal at lower temperatures. Soder-Wick® Lead-Free responds faster than any other conventional desoldering braid. This unique design minimizes overheating and requires less “contact” time thus preventing heat damage to the PCB and sensitive components. For Lead-Free rework, Soder-Wick® has the answer.